In 2012, Zahra Ahmed established the famous Jannat Nazir brand. This famous brand is famous for releasing latest styles from time to time. 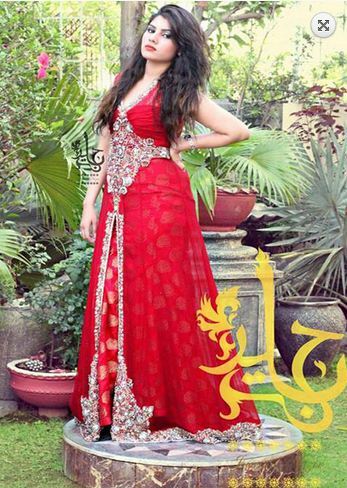 The brand releases dresses according to occasions like bridal wear, party wear, casual, formal and semi formal. All of its collections received favorable response. The brand provides superb dresses for every woman. For the recent year 2017, Jannat Nazir has launched latest party wear dresses. These are formal and wedding wear dresses that have delicate styles. There is also beautiful outline in each dress. Jannat Nazir has used the shades of purple, beige, green, pink, orange and several others. Frocks are included in these Jannat Nazir Exclusive Party Wear Dresses 2017 while laces and heavy embroidery is used to embellish these dresses. All these ready to wear dresses are looking elegant and nice. These frocks are available with churidar pajamas while there are also long shirts with tights in this collection. Trimmings of all these dresses are according to modern styles. Other dresses in the collection include pure chiffon fabric available with multiple color panels, various designs of jamawar, real peacock features with embroidery panels, hand work neckline and brochia. Beads and modern colors are especially used in the whole collection of this brand. In the dresses of this collection, all the colors are very attractive and quality of fiber is very superb. Fancy design of embroidery has been made possible by talented and experienced designers. In a very short time, the brand has achieved much fame and popularity. On every occasion, you can use ankle and floor length frocks. Worth of a dresses can be enhanced with the use of laces and banarsi patti. Fabric like silk, net, Swiss chiffon and crinkle chiffon are included in all the dresses. Outlets of Zahra Ahmed are providing these dresses to the customers. These dresses are also available online at the official site of Jannat Nazir. All these dresses by Jannat Nazir are suitable for party wear and also on other formal occasions. Separate shirts like full embroidery and A-line shirts are also included in this collection. You can also see dupattas and flared trousers in the collection. All these are beautiful fancy dresses that are especially suitable for young ladies.